This is a great writing activity as a follow up to my Economics in France Simulation, but can work on it's own, as well. 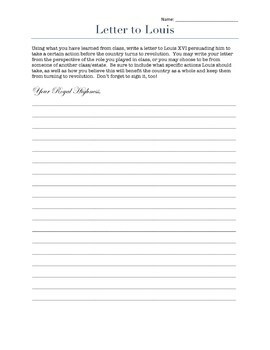 Students write a letter to King Louis XVI on behalf of someone in French society (clergy, nobility, Bourgeoisie, or a peasant), urging him to take action in order to prevent a rebellion. Can be used as a homework assignment, or as an assessment to see if students understand the problems in France and causes of the French Revolution.